Your Car Can Do What? Have you heard of all the new advanced safety features that are now available on 2016 model cars? 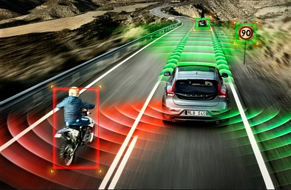 To gain a sense of just how far safety technology in new cars has evolved in the past five years, take a look at your smartphone. Now think of the cell phone you carried 10 years ago. What kind of cell phone did you have 20 years ago? Right! Today's new cars are just as advanced as today's smartphones, and one area where technology is having a major positive impact is in keeping drivers safe. Sure, new cars are quieter, more aerodynamic, they get better fuel economy, and offer more features for your comfort and convenience like Bluetooth and Navigation systems. All of this is certainly impressive, but automakers truly deserve a standing ovation for investing billions of dollars to make our cars safer to drive. I have to admit, until I started doing some research, I hadn't even heard of many of the new driver safety features, and I sure didn't know how they actually work? It's really hard to keep up with all of this information. So, to make it easier for the average consumer to stay informed, the National Safety Council launched a campaign on a new website called, My Car Does What.org where you'll find brief videos and info-grapghics that provide very engaging and easy-to-understand explanations of vehicle safety features for drivers like me who don't have a degree in physics. Back-Up Camera - This feature helps you see objects that are directly behind you as you are backing. A tiny high-resolution camera mounted on the rear panel of a vehicle sends the live image to a small screen usually located on the center dashboard. Remember to use your rear-view mirror and side mirrors to see objects your camera does not pick-up. Back-up cameras will be standard in all passenger vehicles by 2018. Anti-Lock Braking Systems- The ABS sensors detect when your tires lock up and automatically apply a pulse to the brakes, so you can focus on steering your car to safety. The system helps you steer in emergencies by restoring traction to your tires and was designed to prevent your tires from skidding. The ABS has come standard in vehicles since 2011, so you may be pretty familiar with it. Blind Spot Monitor- This is a fairly new feature that warns you when a vehicle is in your blind spot. A warning icon will light up as a warning, and more advanced versions of this feature have added audible warnings when you use your turn signal and a car appears in your blind spot. This feature can be very helpful, but it is important not to rely only on this feature, and make sure you always look over your shoulders before changing lanes. Be sure to check back for our next article, which will cover some of the safety features that were more recently made available. Your friends at CARITAS Vehicle Services wish you many miles of safe driving.